In a newly published paper, oceanographers estimate that global sea levels rose at a rate of ~1.42 mm per year−1 (1.32 to 1.52 mm/yr−1) between 1958 and 2014, a 56-year span that directly coincides with an unprecedented rise in anthropogenic CO2 emissions. This rate (which scores between the estimated sum of sea level rise contributors and a reconstruction from tide gauge and satellite measurements) is similar to the reconstructed rate for 1954-2003 (1.45 mm/yr−1) estimated by Dr. Simon Holgate (2007). 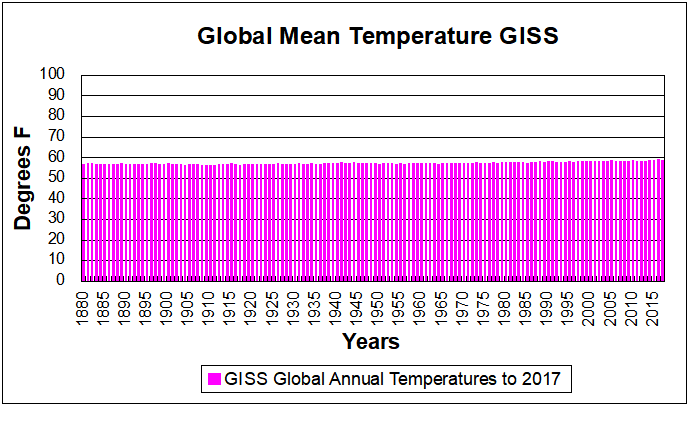 Extrapolating the annual rate of rise over the 56-year period (1958-2014), global sea levels rose 7.95 centimeters (cm) in total, or 3.13 inches during the Anthropogenic Global Warming (AGW) era. Of those 7.95 cm, just 1.17 cm (0.46 of an inch) of meltwater was contributed by Greenland Ice Sheet in 56 years, and the Antarctic ice sheet contributed just 0.37 of a cm (0.13 of an inch). If 3.1 inches of sea level rise over a 56-year span does not appear to be either alarming or unprecedented, perhaps it’s because they are indeed neither — especially when one considers longer-term contexts. As Holgate (2007) summarizes above, the ~50-year global rate of sea level rise was substantially higher (2.03 mm/yr−1) during the first half of the 20th century (1904-1953) compared to the post-1950s period (1.45 mm/yr−1 1954-2003). 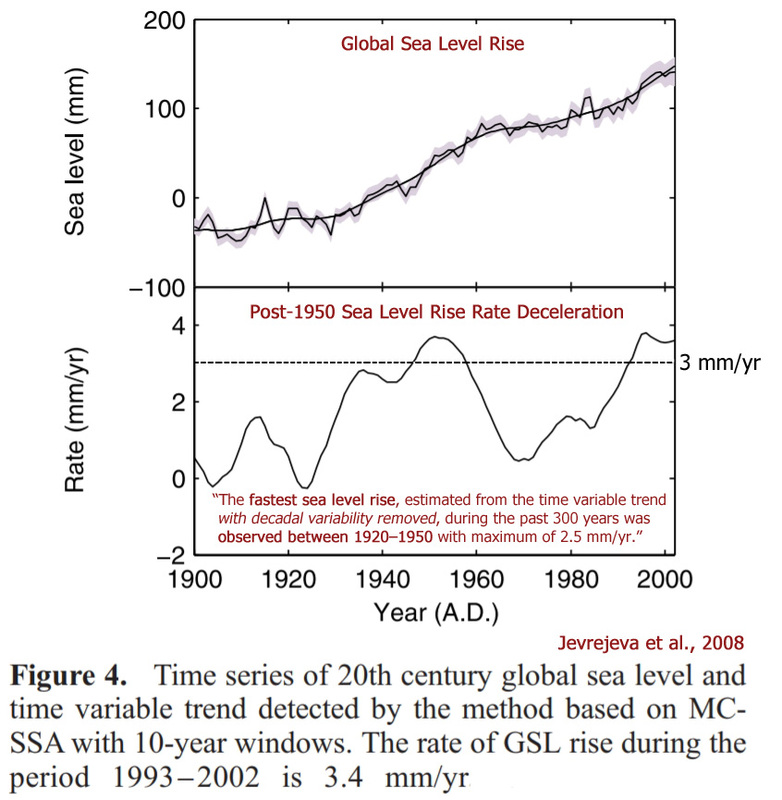 In other words, since the 1950s, global sea level rise has decelerated. The 1920 to 1950 period had rates of rise that were either higher or rivaled the rates of the more recent decades (using satellite altimetry modeling [3.4 mm/yr−1 ]). In fact, when the anomalous decadal variability is removed, the fastest rates of sea level rise occurred during the 1920 to 1950 period. 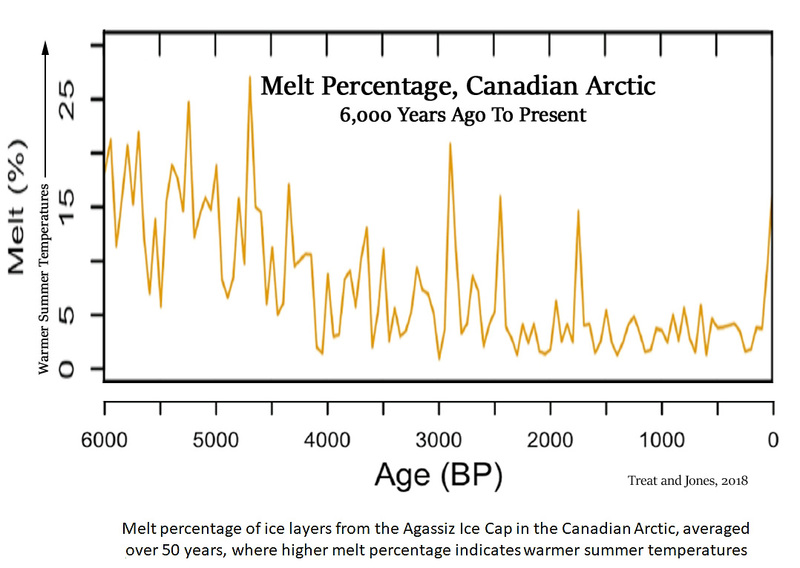 A graphical reconstruction featured in a new paper (Treat and Jones, 2018) affirms that the glacier melt percentage (and contribution to sea level rise) in the Canadian Arctic was significantly greater during most of the last several thousand years compared to the modern era. 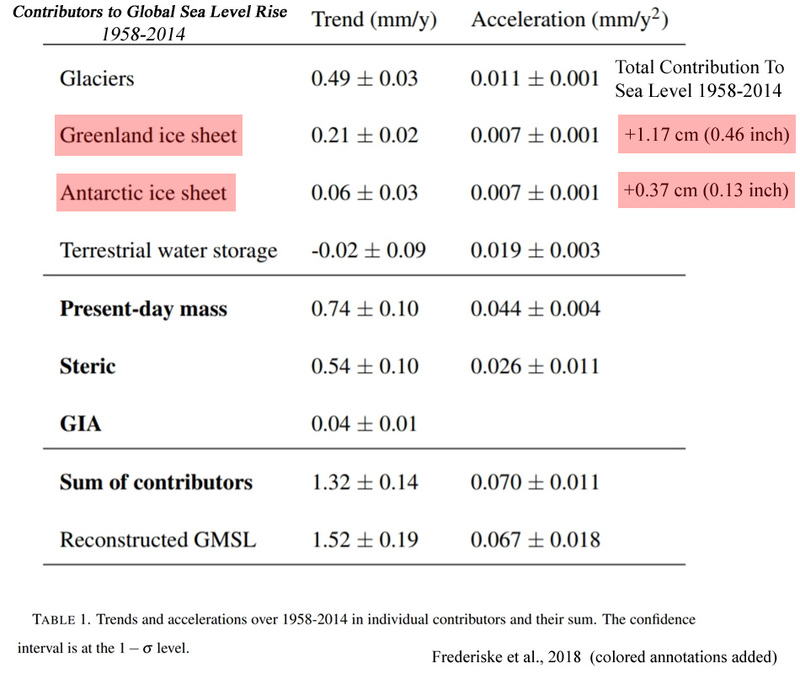 The ice sheet record for the 20th century also reveals that the glacier melt contribution to sea level rise was significantly greater during the 1920 to 1950 period than it has been since the ice melt contribution began decelerating (after the 1950s). As the introductory global sea level graph above and several dozen sea level reconstructions published in scientific journals every year (2016 and 2017) demonstrate, global sea levels were about 1 to 3 meters higher than they are now during the Middle Holocene, or when CO2 concentrations were significantly lower (~270 parts per million). These non-correlations between sea level rise and CO2 concentration would not appear to be consistent with the popular conceptualization that CO2 concentration variations are significant drivers of temperatures, glacier melt, and/or sea level rise. 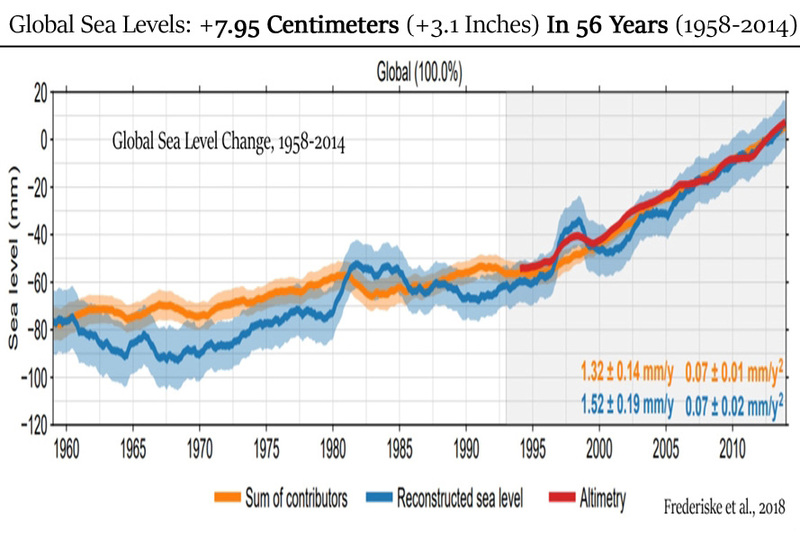 After all, the 3.1 inches of sea level rise since 1958 does not even fall outside the range of natural variability. You have all this data available and yet you come to this strange conclusion? Since when does sea level correlate with CO2? It correlates with temperature (land ice melt and thermal expansion) and different things can cause temperature changes. One thing being an increase in greenhouse gases. They are decreasing the outgoing energy transfer until a new balance with higher surface temperatures is achieved. And that is basically the explanation why temperature won’t correlate 1:1 with CO2 concentration either. Even if the concentration could be fixed on 400 ppm for the next 100 years, it would still cause increasing temperatures. I have a feeling you still don’t quite understand that mechanism and that’s why you come up with these silly arguments. Right or wrong? 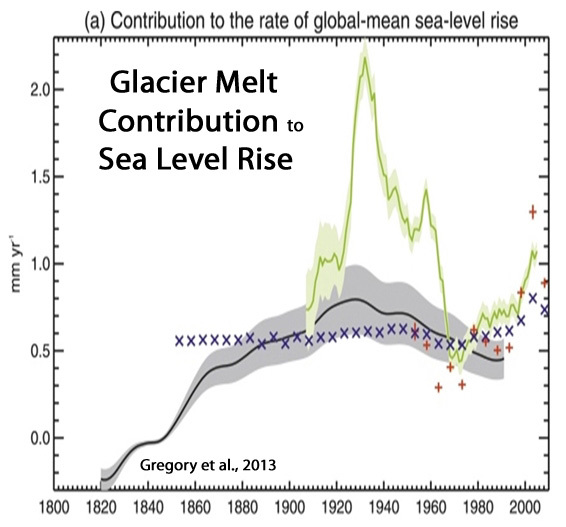 So what’s the explanation/mechanism for the observation that the glacier-melt contribution to sea level rise was more pronounced during the 1920-1950 period, when CO2 emissions were flat and low (~1 Gt/yr), vs. the post-1950s period, when glacier-melt and sea level rise decelerated relative to the early 20th century even though anthropogenic CO2 emissions rose exponentially (to 9 Gt/yr)? Why would sea level rise and glacier melt decelerate with higher and higher CO2 emissions if it’s believed that rising CO2 emissions that cause sea level rise and glacier melt to accelerate? And to what extent does natural variability play a role in glacier melt and sea level rise…since sea levels can rise and fall at rates 10-20 times faster (2 to 6 meters per century!) than the rate observed for 1958-2014? Oh, I would truly enjoy your take on mechanisms. What physical mechanism caused this explosive pre-1950 glacier melt? Be very specific, please. that is basically the explanation why temperature won’t correlate 1:1 with CO2 concentration either. A 1:1 correlation isn’t an expectation necessarily to identify an anthropogenic signal, but the opposite correlation (sea level rise decelerates as CO2 emissions rise) or a non-correlation (CO2 concentrations are stable as sea levels rise by 2-6 meters per century) would not appear to lend support to the position that CO2 concentration changes are a driver of glacier melt and sea level rise changes. Why would sea level rise and glacier melt decelerate with higher and higher CO2 emissions if it’s believed that rising CO2 emissions that cause sea level rise and glacier melt to accelerate? Are you asking this because you really don’t know or just as a homework assignment again? An increase in temperature, specific enough? 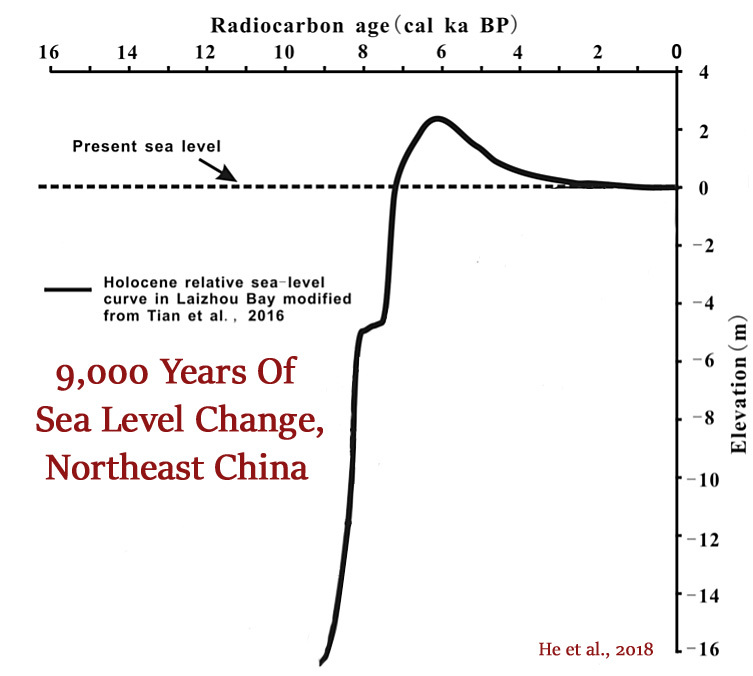 If you really don’t know what causes the sea level to rise and fall and really think that it can’t be global warming induced by increasing CO2 levels because rising and falling happened before, then … wow. Or is it rather that you exactly know that this is what’s happening and are just trolling? 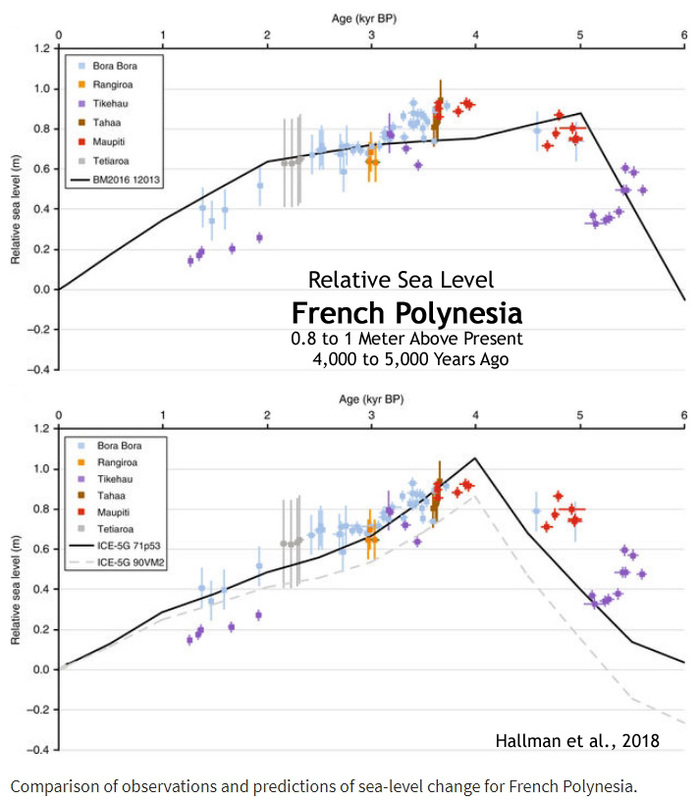 but the opposite correlation (sea level rise decelerates as CO2 emissions rise) or a non-correlation (CO2 concentrations are stable as sea levels rise by 2-6 meters per century) would not appear to lend support to the position that CO2 concentration changes are a driver of glacier melt and sea level rise changes. Not really. You have a lot to learn about complex systems that don’t depend on only one or two variables. It’s never as simple as skeptic’s make it look like. Do you also believe that acceleration, speed and distance travelled (of a car) do not correlate? After all the distance still increases even when you have a negative acceleration somewhere on the way. 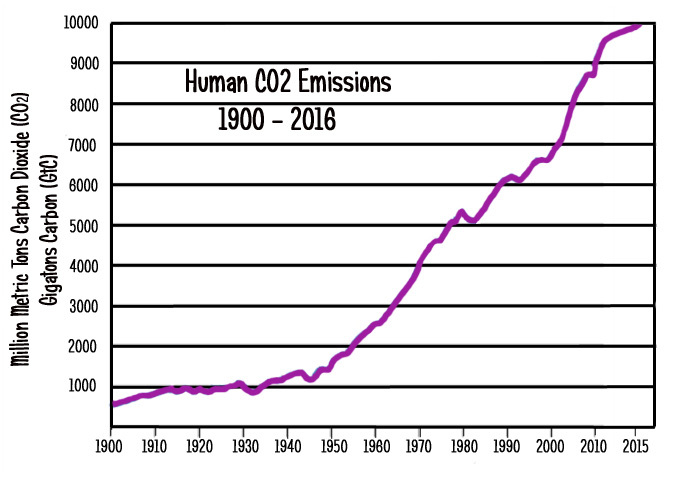 Well, at least you stopped claiming that the CO2 increase has to be natural, since human emissions were stable for a few years. Or do you still believe in that statement of yours? I’m asking this question so as to demonstrate for all who might read it that you are unwilling to answer questions that you know undermine your beliefs about anthropogenic CO2 emissions driving sea level rises/accelerations and falls/decelerations. You didn’t disappoint, as you yet again failed to answer this most basic of questions. It’s not like you’re fooling anyone in your evasions. An increase in temperature, specific enough? Um, no. Identify the cause, the real-world, physically mechanistic cause of the temperature increase that led to that explosive pre-1950s glacier melt (that exceeded the post-1950s glacier melt). Will you answer this question? Of course you won’t. If you did, you’d need to acknowledge that it’s something other than anthropogenic CO2 emissions, which were both flat and low (~1 Gt/yr) during this same period. Again, it’s not like you’re fooling anyone here what you’re doing when you refuse to answer mechanism questions. then, wow. … you exactly know that this is what’s happening and are just trolling. For a brief moment, try to move past these sophomoric “debate” tactics that you so routinely deploy when backed into a corner (i.e., replying to a mechanism question by pretending that I am the one who “really do[es]n’t know what causes sea level to rise” or implying that I am unintelligent if I don’t agree with you or accusing me of “trolling” you by intentionally refusing to acknowledge that CO2 concentrations are determinants of sea level). These tactical devices don’t work. Substance does. Says the very same person who literally believes that, every year, 30,000 species go extinct due to anthropogenic CO2 emissions. It’s never as simple as skeptic’s make it look like. Great. So explain the complexities of the physical mechanisms associated with anthropogenic CO2 emissions that are causing 30,000 species per year to die off…since that’s what you believe is happening. What does the anthropogenic CO2 do to cause all those die-offs, SebastianH? Support your answer scientifically. Then, support your belief that anthropogenic CO2 emissions are causing the oceans to acidify so fast (a -0.000035/yr pH change!) that marine biology cannot adapt…and thus are dying off at rates of 10s of thousands per year. We skeptics are too simple-minded to understand the complexities of these processes. Perhaps you, with your complex and convoluted intellect, can explain how this works. But please use very simple words…you know how easy it is for us to get stuck when you’re teaching us about the vast powers of anthropogenic CO2. Do you also believe that acceleration, speed and distance travelled (of a car) do not correlate? A brilliantly-constructed complex analogy. Thank you, SebastianH. I do not think there is a more polite way of putting it. Will it help? I doubt it. But brilliant! Keep it up! You seem to be letting the class clown off with not having to explain how, and by how much, a tiny variation of atmospheric CO2 warms the oceans. Poor seb is drowning in his abject inability to produce even the slightest bit of scientific backing for ANYTHING he says. It really is passed being pathetic. ! You didn’t disappoint, as you yet again failed to answer this most basic of questions. It’s not like you’re fooling anyone in your evasions. Uh great, can I use this quote when you evade a question? You are aware that you do this all the time, are you? You are kidding, right? Do you think it physically pains us to say this? Why would it be caused by anthropogenic CO2? Why do you think that this is what climate science is saying and that you need to come up with nonsense to “disprove” it? Isn’t that what a strawman argument is? These tactical devices don’t work. Substance does. Then provide substance. Don’t just provide quotes with highlighted sentences that you think support whatever you believe in. Be skeptical about the stuff you think supports a skeptical viewpoint. Why do you think I said that? I believe I just said that already 30000 species are going extinct (a figure I took from a paper/article citing someone called Wilson) as a reply to whatever number you said and claimed was pretty large. I wonder why you came up with that hilarious interpretation of what I wrote. Well, since you ignored the last paper I linked to on this topic and claimed that it was about temperature not acicidity, why should I? You’ll come up with a non-sensical excuse anyway. So you’re the victim here. You’ve been ignored and/or yelled at. And those who don’t agree with your version of the truth are not “sane” readers. So sad this is what you’ve been reduced to. So it’s a homework assignment. No “homework” is required. Or at least it shouldn’t be. You should probably be able to identify the forcing mechanism(s) for the pre-1950 explosive glacier melt…but you are apparently refusing to do so. I understand why, of course. Please stop evading by trying to (wrongly) identify my assumptions. Just answer the question yourself. What was the physical forcing mechanism(s) that caused the pre-1950s explosive glacier melt and sea level rise identified in the Gregory et al. (2013) graph (and many others like it)? When backed into a corner, you once again employ the I-won’t-answer-until-YOU-understand-how-anthropogenic-CO2-forcing-works tactic. It’s not effective, but that obviously doesn’t stop you. And this is because you believe in modeled extrapolations (rather than actual, real-world observations) and catastrophic anthropogenic global warming (CAGW). To enlighten you, the IUCN indicates only 801 species have definitively gone extinct since 1500 AD, with nearly all of those extinctions occurring prior to 1900 (i.e., during the Little Ice Age), and just 1 species going extinct since 2000. It was a mollusc. 1 species since 2000. And yet you claim it’s 30,000 per year, which would mean we’ve had about 500,000 extinctions this century already. Can you name them? Of course not. It’s made-up propaganda…and you fell for it. (a figure I took from a paper/article citing someone called Wilson) as a reply to whatever number you said and claimed was pretty large. A 2004 paper (Thomas et al.) published in Nature claimed that 1 million species would go extinct by the year 2050 due to “global warming”. I pointed out that, to reach that extinction level, 30,000 species would need to go extinct every year. You replied by saying (without citing your source) that we’re already at that level (30,000 extinctions per year), and the number is actually higher than that. Once again, your reliance on made-up statistics, climate modeling, and catastrophic projections has been exposed for what it is: propaganda. Please cite actual observational evidence that 30,000 species per year are going extinct. Climate models, simulations, and extrapolated assumptions are not observations. Well, since you ignored the last paper I linked to on this topic and claimed that it was about temperature not acicidity, why should I? SebastianH, the paper you linked to indicated clearly in the abstract that the reason why there was a coral die-off during the most recent El Nino warming event was because temperatures rose by 2-3 degrees C. It did not state that the 200-year “trend” in pH lowering (-0.07) is what caused this die-off. That is your claim. Did you not bother to even read the abstract to a paper you cited? This Why-should-I-answer-you-when-you-ignore-what-I-write-anyway tactic is tactically sophomoric. 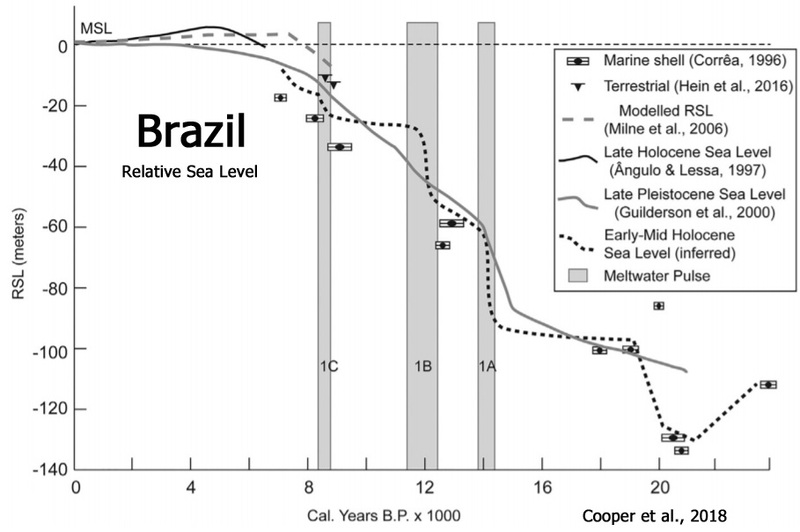 Please identify a paper that supports your belief that the 200-year “trend” in alleged pH-lowering due to anthropogenic CO2 emissions is too fast for marine species to adapt to (even though natural pH variability/fluctuation is 10-100 times faster than the 200-year “trend”). So, do you think acceleration, speed and distance driven correlate? Still waiting for seb to come up with the name of one species that has gone extinct because of human CO2. Scientific proof required, not just mindless rhetoric or evasion. One out of 30,000.. surely the little child-troll can provide that. After months of slouching in the back seats, yapping mindlessly and disrupting the room like a demented Chihuahua …. ….. seb now wants someone else, ANYONE else, to do his actual work for him and find some actual science to support his anti-science fantasy ravings. Apparently, its now OUR homework to support his fairy-tales!! He has given up ANY PRETENCE of actually being able to support any of his fantasy junk-science. Yet another totally irrelevant and mindless analogy. If seb actually understood anything about basic physics, he would comprehend the gravity thermal effect. Poor little sad sack STILL HAS NO EVIDENCE that CO2 causes warming of oceans or our gravity controlled convective atmosphere. Not an analogy, AndyG55. Just three variables that are connected to each other by equations/formulas. I want to know from Kenneth (or you) if he thinks the values noted on a graph would correlate to each other. When you do attempt anything related to physics, YOU FAIL COMPLETELY. The car analogy is a totally IRRELEVANT attempt at distraction. A child’s ploy !! You cannot splice a corrupted, adjusted, fabrication onto the end of actual data. It is nothing but a mindless propaganda ploy. If you don’t know that, you further highlight you continued ineptitude at basically every facet of science, and maths. This car thing is yet another childish way of avoiding any actual issue. Seb may have done some junior high physics at some stage (and failed).. but its all he can remember. Poor seb, STILL doesn’t understand that his so-called mechanism is a load of anti-science tosh. … and he STILL can’t produce any actual empirical science to prove CO2 causes warming of our atmosphere or of our oceans what-so-ever. Poor little child-mind lives in a la-la-land of non-science, brain-washed fairy-tales. Empty As always.. Poor seb. Where’s some of this actual SCIENCE you always rant about having? So far…. missing in non-action. !! You STILL haven’t produced any actual empirical science to prove CO2 causes warming of our atmosphere or of our oceans. Off you go, back to la-la-fantasy land. So why is it that AndyG55 has to “provide sources” to support what he writes, but you don’t have to support what you claim when you write? You have presented ZERO EVIDENCE. It is beyond your capability. Just the usual EMPTY fantasy non-science we have all come to expect. Yes, SebH, we are getting VERY tired of your telling us there is evidence, but refusing to show it; and of your telling us there is a mechanism, but never telling us what you think it is.Your preaching is getting tiresome, which is probably your primary intent. Now for the umpteenth time, please have the courtesy to tell us what you think it is. If you can’t, then you have no grounds to complain about being treated with the same contempt you show to us. I should provide a source for this? O-k … weird, but I guess since I said this, I am the source. Is it possible you didn’t realize that you are asked to provide a source for claims like the following…? Desertification. roflmao…. satellites show the opposite happening [greening]. You are avoiding posting any. !! Glad to help the chatbot by providing the link I posted in response to his desertification claim. It took longer to post the response than it did to find it online, which shows that SebH (AS USUAL) didn’t even try. Pleased to see you back, Seb. Your contributions always give me a good laugh. PS what did you think of President Trump’s SOTU speech? I’d hate if my comments made you cry, so I guess that’s a good thing. As I am not a U.S. citizen I haven’t watched this or any other state of the union speech. I’ve read about it and the fact checking sites got something to do again … and I’ve seen that Trump claims that it was the biggest (TV) audience in history ever or something like that, also not true at all. SOUR, BITTER and LOSING. !! And yes, you ARE clueless. And you are proud of it, displaying your cluelessness with every post. Trump has actual real scientists to guide him around the leftist climate-change propaganda. There is about as much evidence for AGW, as you have produced. I had real trouble keeping the coffee in my mouth reading that comment of yours … hilarious reply! You are getting better with every comment. You make 3 toed sloth look good. ! Note, Andy, how the chatbot just, ahem, “borrows” our conclusions about him, and uses them against us without any accompanying proof. It’s a leftist technique to try to make their critics look bad: mere evidence-free assertions. Typical leftist distracting from his own deficiencies by accusing others of those same deficiencies. Tiresome, boorish, overgrown petulant children. Oh dear the cAGW alarmist argument fall apart again when the evidence is properly looked at instead of just believing some sort of computer modeled planet. When you build a whole anti-scientific religion on the quicksand foundation of CO2 warming, no amount of slush-funding, data-bending and brain-wash propaganda can stop it collapsing eventually. Puts the whole idea of the planet overheating into perspective wouldn’t you say? Yep, the oceans are cooling as the transient of the El Nino and N. Atlantic blob subsides. You can see the La Nina tongue quite clearly. Only place with any of the El Nino warm anomaly left is the Arctic, in mid winter. ! If only you guys would be able to properly look at anything instead of only re-enforcing what you already are convinced to be the truth. If only you could support ANYTHING you said with even the slightest bit of real science. !! You remain an EMPTY sad sack. And here I thought only AndyG55 would play this mirror-game. Come up with an answer to how acceleration, speed and distance driven correlate? Looking at a graph of all three, would you recognize the connection between all three variables? More evasionary irrelevant garbage from seb. You seriously need to get further than your junior high physics, seb. We’ll be happy to consider anything that the data support. So the ball is in your court. SHOW US THE DATA! OT, The El Nino/ NA Blob transient continues to dissipate. This makes Jan 2018 the 10th warmest January in the UAH data. NH: the Arctic warm from the El Nino is still yet to fully subside. January 2018 is in 5th place. Go live in Siberia if you don’t like the warming out of the COLDEST period in 10,000 years. You really are getting DESPERATE, aren’t you, seb. zero steps forward.. 10 steps back.. the story of your time here. That Ok AndyG55, in the next couple of weeks people in Europe will be hoping for some evidence of global warming. ” Back in 2009, a conference of British “eco-psychologists” argued that “climate change denial” should be classified as a form of “mental disorder” — a notion cheered on by American progressives. Fits the person aimed at. 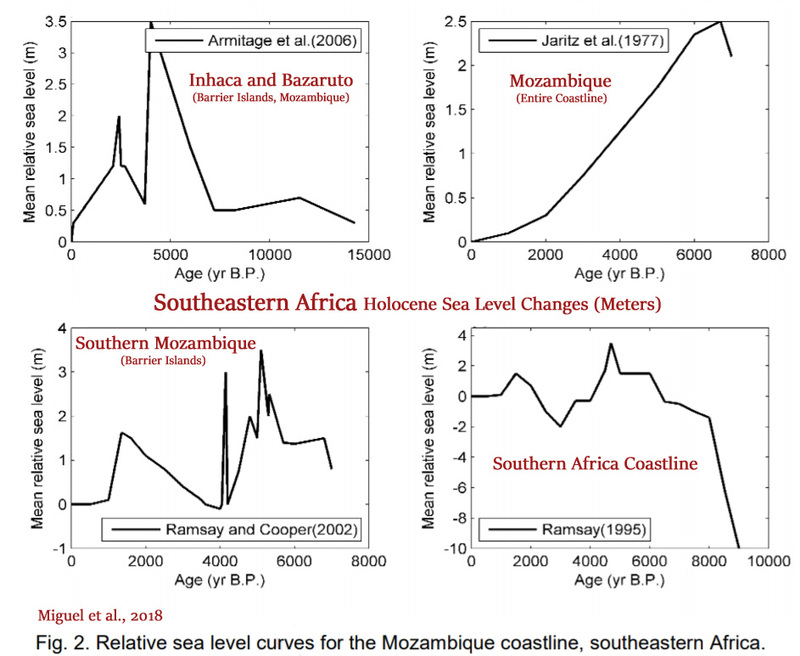 I note at the PSMSL site they have just one paper about sea level- the Church and White that ‘found’ the acceleration and more importantly confirmed the climate model. I know there are many papers that say different— no acceleration. But there is the one cherry that got picked and it’s the only one paper that’s mentioned at the government site. If one wanted to make the case the ‘science’ is being run by propagandists instead of scientists at the moment, I would suggest that would one of a number of ‘smoking guns’. I don’t care if sea levels go up or down by 29 meters either way. Yet they never say it to themselves and hate it when you do to their blathering.